[King of Prussia, PA, October 22, 2015] – Leading global medical device designer and manufacturer, Devon Medical Products, announced today the launch of their portable Deep Vein Thrombosis (DVT) Prevention Therapy Device, with features designed to bring convenience to patients requiring pneumatic compression therapy. This powerful device can be used at home or in a hospital setting to aid in the prevention of DVT and enhance circulation, which could help diminish post-operative pain and swelling. The sleeve is made of a soft, breathable material and is simple to apply and adjust as necessary in an effort to provide comfort and reliability. “As the patient population at risk for post-operative DVT increases, we believe this product provides a complete solution in preventing this serious condition. The product’s best in class battery life and simple design will enhance patient compliance, the goal of all post operative care” Ross said. The Cirona 6300 works to simulate blood flow in the extremities through the use of pneumatic compression and may help prevent the early onset of blood clots that can occur after certain traumas or in post-operative settings. 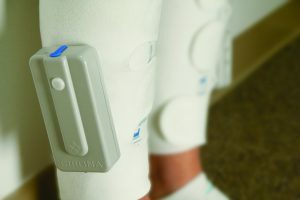 The Cirona 6300 is available through Midway Medical who can be reached at (844) 436.9290 or visit http://midway-medical.com/. Devon Medical Products, Inc. (www.devonmedicalproducts.com) is a global medical device manufacturer, designer, and distributor. We develop high-quality medical devices that are affordable for healthcare markets and patients worldwide. Our product lines include extriCARE® Negative Pressure Wound Therapy Systems, CircuFlow® compression therapy pump series for the management of Lymphedema, ArterioFlow® 7500 arterial compression pump for the prevention and treatment of ulcers, Cirona® 6100 Deep Vein Thrombosis prevention pump, and Nature’s Bond breast pump. We are headquartered in King of Prussia, Pennsylvania, with international offices staffed with bilingual engineers, product development teams, and regulatory experts.